The only problem? 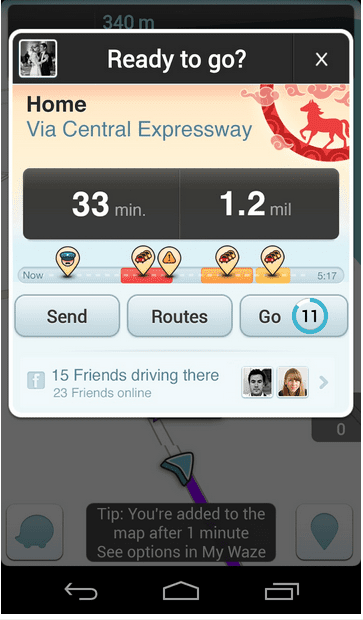 Interacting with Waze can be fun to the point of distraction, so it's not for solo drives. On family road trips, let your 'tween or teen co-pilot take the phone (setting your Waze mood to ninja, zombie, or sunglass-sporting cool cat) so that your family can safely give as well as receive useful information as you travel to your destination. Where did you put that rental car confirmation number? What's your hotel's address? Do you find it hard to keep track of all your important travel details? TripIt is a genius app that simplifies your travel plans with zero drama. Just forward the confirmation emails from relevant providers—hotel, airfare, car rental, and so on—and Tripit magically converts them into a concise, chronological trip itinerary with all the important information in one place. Use it once and you'll never look back. The best local guides are always awesome storytellers. They dish the most interesting details, flavored with a pinch of gossip and a generous dollop of historical trivia—and in the process, they make your trip richer and far more memorable. Putting a social spin on great storytelling, Findery collects virtual notes left by locals and visitors about the places they've been. Now available as a free app for Apple and Android smartphones, Findery is a modern-day cross between geocaching and a Moleskine journal; it lets you find and leave little treasures along your journey and also keep a fun record of your own travels. Navigating an airport layover with kids in tow can be a certain kind of torture, but knowing the lay of the land can be a game changer. The indispensable GateGuru app provides detailed airport maps, helpful navigation tips, and lists of restaurants and amenities tailored to arrival and departure terminals. You can quickly find out the location of the nearest bathroom or children's playzone and also if there's a Starbuck's or Jamba Juice along your gate-to-gate path. Meanwhile, the JourneyCard feature keeps you posted in real-time on updates to security wait times, flight delays, gate changes or layover time adjustments. Heading to a Disney park this year? With Disney's MyMagic+ planning system and wearable MagicBands, the old paper ticketing system is now obsolete. The free My Disney Experience app pulls everything together and helps you make the most of your time at Disney World. You can get wait times for attractions and showtimes, find character meet-and-greets, browse restaurant menus and make dining reservations, and even reserve ride times through the new FastPass+. ​Heading to Disneyland in California? Every family has its favorite chain restaurants, and maybe you are loyal to a certain gas station brand. If you've ever wished you had a crystal ball on a road trip to tell you exactly which restaurants, gas stations, and other amenities lie ahead on your route, check out RoadNinja, a free app that hits the fastforward button and shows you what's coming up at future exits. The app can tell you what's available at upcoming exits up to 3,000 miles ahead, and you can customize the exit list with your favorite brands and filter exits by category. You can also use the app to view and compare real-time gas prices, and redeem location-specific special offers and coupons along the way. What's the best way to treat a jellyfish sting? What are the warning signs of heatstroke? Is there a hurricane coming your way? When it comes to health and safety, the American Red Cross has your back with these two essential apps. An essential road trip app, GasBuddy can help you estimate how much you'll spend on a car trip. Using real-time reports from other app users, it can also direct you to the cheapest gas stations along your route. Genius. Does your son have a gluten intolerance? Is your daughter a vegan? Or are you trying to stick to a low-carb plan? Whatever your dietary needs, HealthyOut lets you quickly find healthy restaurant choices in over 500 cities across the country. You can search by calories and points, nutrition tags and more. Getting around in the big city with a little one in tow has become a bit easier and safer, now that the popular Uber ride-service app has launched a family-friendly spinoff service in three major cities. City cabs are not required to provide safety restraints for children. But with UberFAMILY, you can order a taxi with a car seat for an additional fee of $10 on top of the normal fare. While family vacations offer plenty of opportunity to spend time together, there are also times when it makes sense for the group to split up. A free app called Glympse lets you keep tabs on each other without having to interrupt each other with texts or calls. For folks who belong to an auto club for the peace of mind of having roadside assistance, a free app called Honk lets you quickly call a tow truck or mechanic without the annual membership fee. The app gives you access to 24/7 highway help from a database of more than 20,000 independently-owned tow trucks and garages, with service starting at under $50. Whatever your reason for seeking a last-minute hotel, the HotelTonight app can land you a super deal with just three taps and a swipe. By matching travelers with unsold hotel inventory, HotelTonight can help you find a room for tonight or up to a week out, at more than 15,000 hotels in over 500 destinations all over the world.